Use OneDrive for Windows mobile devices to save and share files, including documents, photos, videos or music files, just as with OneDrive on your computer. Select the file or folder you want to share, then tap Share > Share a link. Select whether you want recipients to be able to View and edit the file, or make it View only so recipients can only read it. In the Share list, tap the app you want to use for sharing the link. You might have to scroll the list upward to see all the options. Select the file or folder you want to share, then tap Share > Invite people. Under Invite people, enter the names or e-mail addresses you want. Tap Add to enter more names. Tip: Look under Recent contacts - the person you want to share with might be there. Just tap the name to send that person a message with a link to the file you're sharing. If you want the recipients to be able to add changes or edits, check the box at Allow editing. Uncheck that box to make the file read-only for the recipients. Tap OK . The recipients get an email message with a link to the document. Select the file you want to share, then tap Share > Send files. In the Share list, tap the app you want to use to send the attached file. Note: Sharing as an attachment works only with individual files. To share a folder, use Invite people or Share a link. 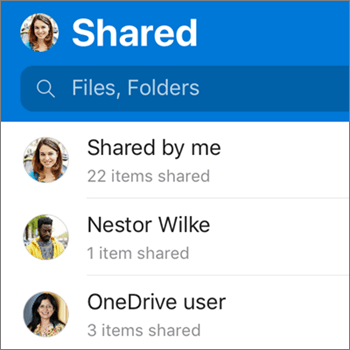 In the OneDrive for Business app, open the file or folder you want to share and tap Share . To share multiple files or folders, tap Select , tap the items, and then tap Share . Under Invite people, tap where it says "Type a name or email" and enter the person you want to share with. Tap Add to enter more names. Select whether you want recipients to be able to Edit the file, or View the file as read-only. In the Share list, tap the app you want to use for sharing the link. You might have to drag the list upward to see all the options. At Add people to share with, enter the names or e-mail addresses you want. Tap Add to enter more names. Note: Look under share with a recent contact - the person you want to share with might be there. Just tap the name to send that person a message with a link to the file you're sharing. Tip: Sharing as an attachment works only with individual files. If you want to share a folder, use Invite people or Share a link.